We've got two videos for you this morning for Halo Reach. One of them an official video documentary called "A Spartan will Rise," the other something a little more unofficial that may be part of a viral marketing campaign. A Spartan Will Rise looks at the six members of Noble Squad and profiles each character's strength and weakness. Narrated by an eerily familiar voice we learn about the imminent downfall of humanity's last fortress in the stars. But hope isn't lost, in fact it rests squarely on the shoulders of a Spartan named Noble 6 - one of only two ranked at an elite level. This second trailer was uploaded to YouTube this morning and as of now, only has official ties to Halo Reach via an ARG. The live action short has three soldiers standing near a burned out Warthog talking about being on patrol. Suddenly they're radio'd about an insurgency. "It's bad enough we have to fight the Covenant, but now we have to fight our own people," says one soldier. This may be the start of a viral campaign similar to that found before Halo 3 where we had interviews with "real soldiers" who were in the final battle with Master Chief. 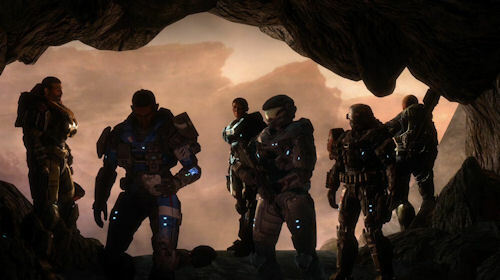 With Halo Reach less than a month away you can bet the marketing is about to be kicked into high gear.